Only one of the two pugilists has the power to change that. Pacquiao will always be a boxing legend, no matter what happens in the ring at the MGM Grand Garden Arena on Saturday night. For Broner, this feels like the last chance to stop being a letdown and take a step in the direction of legend. But the sports betting odds suggest maintenance of the status quo is the most likely outcome in this 12-round welterweight clash. 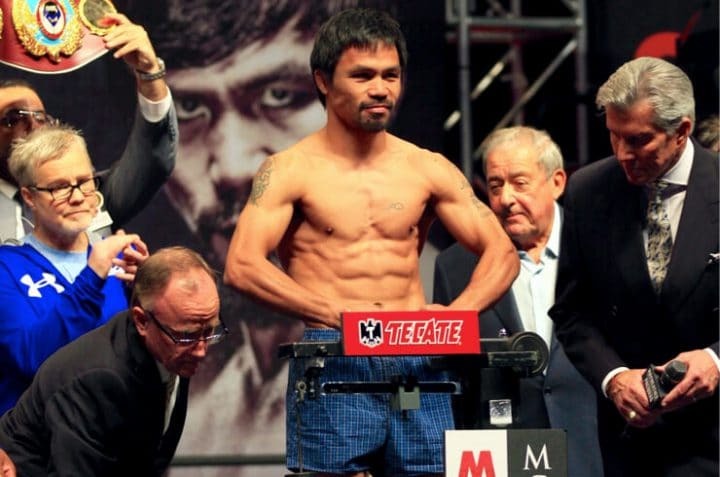 Despite his advanced age, Pacquiao, fighting for the first time since turning 40, is the favorite everywhere you look. Boxing’s only eight-division champion (a somewhat deceiving stat, given the modern proliferation of weight classes and alphabet belts, but a magnificent accomplishment just the same) remains one of the sport’s most bankable stars, despite a lackluster performance against Floyd Mayweather in 2015 and a controversial decision loss to Jeff Horn in 2017. The 29-year-old Broner is also bankable, but not entirely for the right reasons. His mouth, his willingness to say and do whatever on social media, and his extravagant lifestyle have given him perhaps boxing’s most lopsided marketability-to-accomplishment ratio. Broner has essentially followed the Mayweather blueprint … except for the parts about taking his craft seriously and developing skills to match his talent. Broner is 33-3-1 with 24 KOs and, despite having won belts in four divisions, is arguably still in search of a signature win after more than a decade as a pro. Pacquiao is 60-7-2 with 39 KOs and has nothing to prove. But the Filipino congressman wants (or perhaps needs) to keep making money, and giving and taking punches is how he does that. In seven of the 11 markets, the better price is at FanDuel; three are better at DraftKings; one is the same at both books. If you look at them collectively, you can actually get a modest vig on straight-up winner picks, with Pacquiao at -280 (FanDuel) and Broner at +240 (DraftKings). At BetStars NJ, you can get an even better price on Pacquiao, -225. So across BetStars and DraftKings, bettors have a rare opportunity to guarantee a profit by betting both sides … as long as the fight doesn’t end in a draw. Meanwhile, at the host hotel in Vegas, the pricing is similar. The MGM Grand Race & Sports Book has Pacquiao at -300, Broner at +240, with some money apparently having come in on “Pac-Man” since the fight opened at -280/+230. The will go/won’t go on site is different than online, as you can bet on whether the fight will or won’t last 11 full rounds, rather than 12. “Yes” is -260, “No” is +220. MGM is the best place to bet on Browne to upset Jack, as you can get +170 on the underdog there; Jack is a less appealing -210. As for the methods of victory, there’s not a single one where the odds are better in Vegas than in Jersey. At MGM, Pacquiao by decision is 5/6, Pacquiao by KO is 5/2, Broner by decision is 19/5, Broner by KO is 9/2, and a draw is a mere 15/1. There are no guarantees in any form of sports betting, but there’s one particular outcome that logic is pushing most of the experts toward on this fight. But at -280 or -300 or -305, the bang for the buck is limited. Look closer and you’ll see that Pacquiao has scored one knockout in his last 14 fights, and Broner has never been knocked out — and only one opponent, hard-hitting Argentine Marcos Maidana, has ever knocked him down. So logic suggests the most likely outcome is Pacquiao winning but Broner lasting the distance. If you can get it at +105 online, or even if you have to settle for a slightly worse price, that sure feels like the chalk play. At the same time, there’s always something to be said for betting a draw in a fight likely to go the distance. Especially at +2300, you won’t be too let down if it loses, and you’ll feel like a legend if it hits.